I have yet another confession. I have a thing for Hummus. It’s fast, easy, healthy, and ridiculously customizable. This batch has cilantro and lime. I used to hate cilantro with a fiery passion. Like I still hate ginger. or bacon when I go to a restaurant and it’s undercooked and cold.There’s some food everyone hates. I don’t judge. Unless it’s ice cream. or hamburgers. or pepper jack cheese. Then I will judge you like Michelle Bachman. Consistency: smooth and creamy but somehow leave an after feel of wet chalk. Look: straight out of a hose. Taste: have some cool sounding flavor but make sure the taste of every one is what you would imagine horse piss would taste like. Guest at party: What is this in this bowl? You (mumbling): oh it’s just hummus with some baby carrots. Obviously the cilantro lime hummus party was better. But you can test that out for yourself. There’s limes, cilantro, hot sauce, garlic, and the kicker? Almond butter. 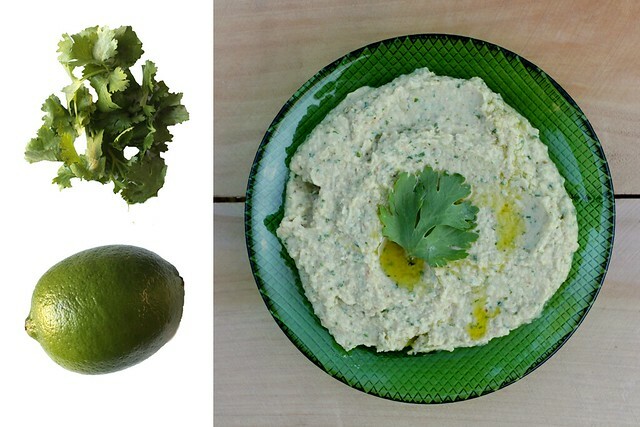 The slight flavor works wonders with the cilantro and lime, and it once again tells the tahini to shove off. Try this for a dip with veggies or chips, or wrap it up in a whole wheat tortilla with some sprouts, turkey, avocado or tomato. Take that to the park and devour it in the sunshine. The recipe I have here is for canned garbanzo beans. But the directions, if you have the time and want to go the cheaper route, for dried beans can be found at the other hummus post here. 1 1/2 T natural unsweetened almond butter. Pulse the chickpeas and cilantro in a food processor until lightly chopped. Add everything else and process until you have your desired consistency. Awesome sauce. Dinner, here I come. Various spices can be added to the dish. It depends on your preferred mix.